The rotary table can rest itself, which ensures the correct positioning of pallet enterance and exit. By programmable control(transducer control), the performance is reliable and maintenance is convenient. 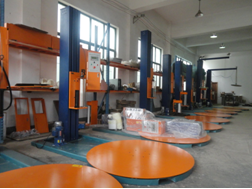 It measures the height of object and is suitable for heavy pallet.